In keeping with the tradition of having two series running at FX three-day events, the Saturday series that was previously named the FX-Nationals will now take on the higher profile mantle of the AFX-SBK Championship Series. Our intention has always been to raise the profile of the Saturday racing and what better way to do that then to have our longest running sponsor Yamaha and YMF Loan taking up the AFX-SBK naming rights. Nothing has changed from what was previously announced, both series will be run over the previously announced six round calendar. 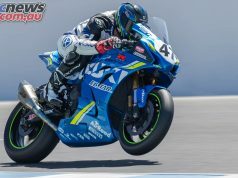 There will be Friday practise and qualifying for the Saturday AFX-SBK racing and the quickest lap times a rider puts down in Saturdays racing will be their qualifying times for the Sundays ASC racing. Again, both Saturday and Sundays series will be mirror image events with all classes getting three races each day which will point score for their own series and respective championships which kicks off with round one at NSW’s Wakefield Park Raceway on the weekend of the 15th – 16th March. Yamaha has once again stepped up with some excellent bike prizes for the AFX-SBK series which will be announced later today for privateers in the Superbike class and both outright and C/D graders in the now privateer only Supersport class and the yet to be announced longer distance Sunday feature race, the Formula Xtreme Challenge Cup, that is open to A, B and invited C grade Superbike, Formula Oz, Pro-Twins and Nakedbike F1 competitors. Anyway more news on the bike prizes and the Formula Xtreme Challenge cup later. Now we have finalised the bike prizes for 2014 we will be able to finalise both the Swann Insurance ASC Series and YMF Loan AFX-SBK combined Sup Regs and entry forms which we expect to be available very late today. I would like to thank Yamaha and YMF Loan for once again supporting our race series and look forward to another great year of Australian motorcycle road racing at its best.